Home » Association News » The Ones Left Behind. 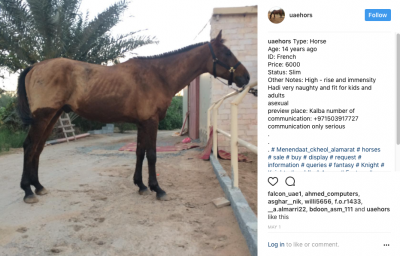 On countless occasions, those of us trying to highlight the abuse of horses in many of the Group VII countries have been told by breeders, sellers or riders involved in some way with these countries that the horses will all have fabulous retirement homes, 5* luxury, they know, they’ve seen them. The reality is different. There are no fields to retire horses to, there is no horse-friendly turnout. And with the turnover of horses through the desert yards, they physically couldn’t facilitate housing them all. So, to follow up the story of Mississippi, and The Wrong Horse, here are more of the imported horses found that have spiralled down the system and landed without a safety net. 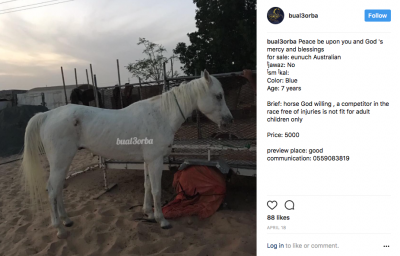 All these horses have sold to the Gulf region from either Antipodean or European homes. The below are from one dealing yard in the UAE, in a short space of time. Above is COOLINDA PARK EMBEZZLER in the dealing yard. He had a great track record in Australia. He’s still registered as being Active status on the FEI database. 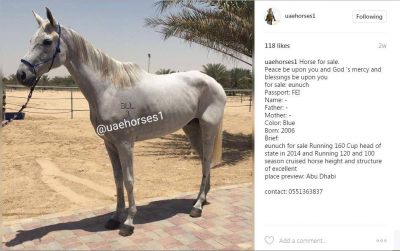 He’s currently under the ownership of Saeed Abdulla Bin Huzaim (FEI 10083445) who rides for the Sheikh Mohammed Emaar Stable. Even for the UAE this rider has a dire competition record. This horse is registered as inactive. 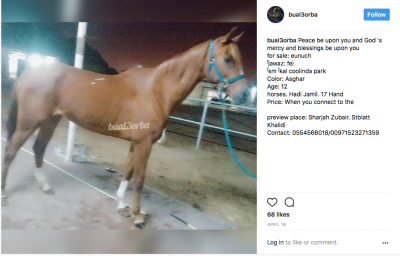 His current owner is Juma Ibrahim Mohd HUMAIDAN (FEI 10028041), whose stable appears to be Dubai World. He also has an abysmal competition record. The next three, we don’t know who they are, but the adverts say the nationalities. This little grey Australian horse looks utterly broken. This is a French horse looking at best uncomfortable. And here’s another French horse. 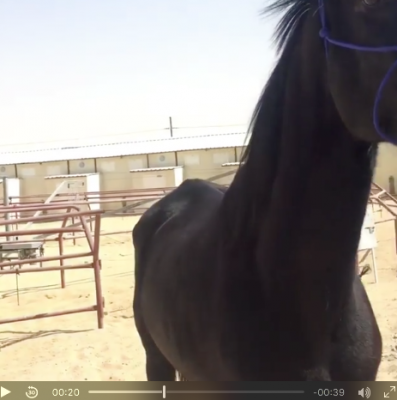 The stills are bad, but look at the VIDEO and see how these poor horses are regularly handled. Such fear of the bloated handler from that emaciated little horse. Perhaps the sellers of these sorry creatures can step up and explain what happened to the lovely retirement homes we’re assured they receive? Next up, a change of discipline to show jumping. You know, where all is rosy, and they too have fabulous forever homes. This is a British bred ISH, JOE FABULOUS. He’s only EIGHT years old. He’s not looking too fabulous right now, is he? Still, his registration is active, so he must be fine, right? **Edit – according to the ISH database, Joe Fabulous was foaled on 2002. So that opens a few cans of worms – why is he down as being a 2009 foal on the FEI database? All that aside, he’s still in desperate shape for a 15 yo. That back leg. So, these are the ones that are considered worth a few dollars, still. The ones that don’t yet need to be abandoned. Tell me again about the retirement homes in the UAE? 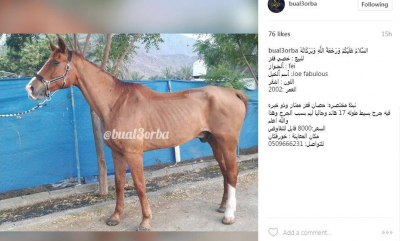 STOP sending horses to these Nations. STOP enabling the abuse.